Yesterday, U.S. Agency for International Development Administrator Rajiv Shah and I signed a five-year memorandum of understanding to expand our agencies’ joint efforts to overcome international development challenges such as food security, climate change, and energy and environmental management. The agreement also encourages NASA and USAID to apply geospatial technologies to solve development challenges affecting the United States and developing countries. 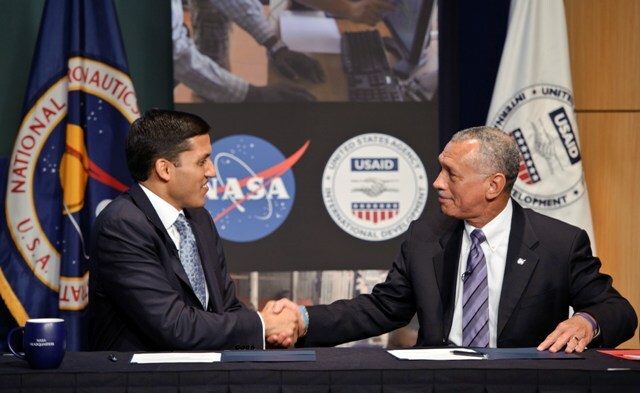 Since 2003, NASA and USAID have worked together developing and expanding the SERVIR program. The program allows people in developing regions to use Earth observations for addressing challenges in agriculture, biodiversity conservation, climate change, disaster response, weather forecasting, and energy and health issues. We also partner on the LAUNCH forums that support science and technology innovators in the non-profit and private sectors. The program’s goal is improving innovations to achieve greater impact on sustainability issues. And, we’ve agreed to explore how efforts promoting science, technology, engineering and mathematics education can be advanced through joint support of programs such as Global Learning and Observations to Benefit the Environment (GLOBE). GLOBE is a worldwide primary and secondary school-based science and education program funded by NASA and other U.S. agencies. Technologies for NASA missions have long improved life here on Earth. Together with USAID, we’ll meet even more sustainable development challenges here on the ground, solving problems for the world community. As we explore space, we’ll also be exploring solutions to important health, nutritional and safety challenges in developing countries.